I know what you're thinking. Pigs in a blanket are so yesterday. Well, you know, what goes around comes around and pigs in a blanket are back again. Really, they never left. Everyone loves pigs in a blanket and always has. Go ahead and serve them at your next party. You'll see them fly off the plate. 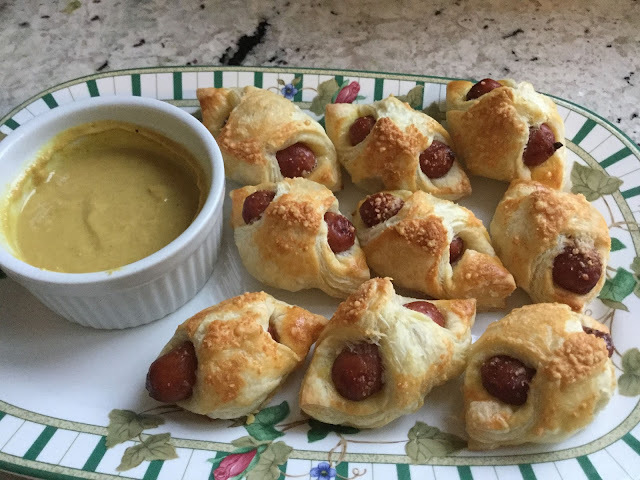 These kicked up, Parmesan crusted, pigs in a blanket were inspired by a frozen, prepared version I purchased at the grocery store. They were a specialty item being offered during the holidays and I bought a box of twelve to try them out. They were good, but a little greasy. I was sure I could make them better and for less money. The store brand cost approximately $0.42 each. My version cost me about $0.24 each. 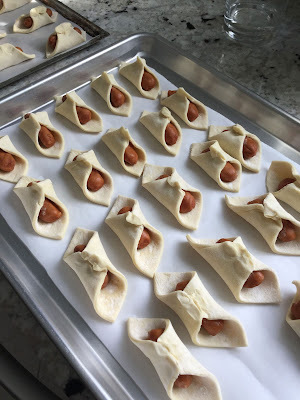 You can prepare these pigs in a blanket in advance and freeze them so they'll be ready whenever you need a quick go to appetizer. Just brush them with a little egg wash and sprinkle the Parmesan cheese on each before you pop them in the oven. Don't forget the honey mustard sauce. You can make your own or use a prepared honey mustard sauce you like. Prepare your baking sheets with a sheet of parchment paper to fit. Defrost the puff pastry according to the package directions. 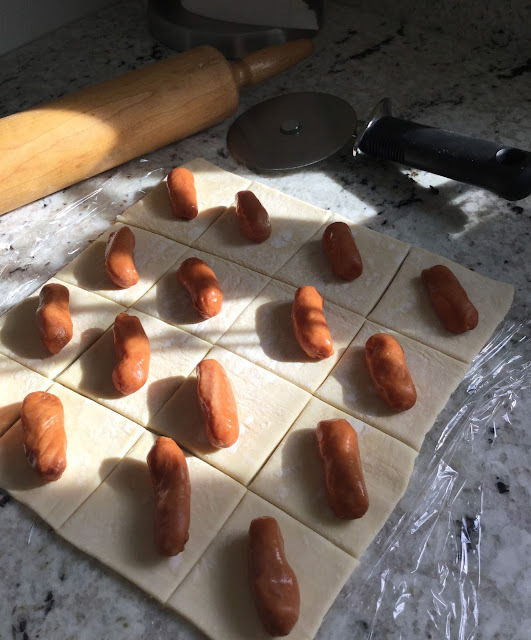 While the puff pastry is thawing, drain the little smokies sausages in a colander. You want the sausages to be dry. Beat the egg with two teaspoons of water. Brush the egg wash over each pig in a blanket. Sprinkle generously with grated Parmesan cheese. Place the pan on the center rack of your preheated oven. Bake for 20-25 minutes, until crisp and golden brown. Cool slightly. Serve with honey mustard sauce. To make the honey mustard sauce: Mix 1/2 cup of Dijon mustard with two generous tablespoons of honey. Taste and add more honey if desired. To freeze and serve later: Do not add the egg wash and Parmesan cheese. Freeze the pigs in a blanket on the baking sheet for several hours and then transfer to a plastic freezer bag. When ready to bake, place the pigs in a blanket on a parchment lined baking sheet. Brush with the egg wash and sprinkle with the Parmesan cheese. Bake as directed. I agree -- did these ever go out of style? I love them! It seems like we went through a phase where appetizers needed to be constructed works of art to be cool. 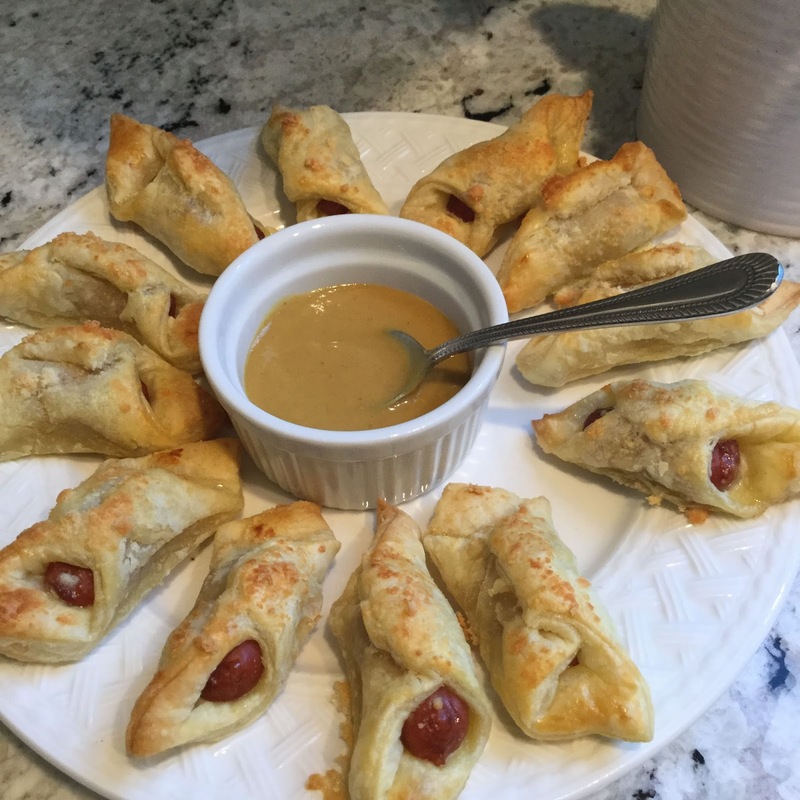 It's been a long time since pigs in a blanket were served at any party I was at. I'm bringing them back! I haven't had these in awhile! Liking the Parmesan addition. Thanks for linking up to Merry Monday! Sharing on Twitter! Have a great week! I know, Kim. They seem "Old Hat", but the Parmesan really snazzes them up! Thanks for stopping by. OMG this looks delicious! I'm trying it this weekend! Thanks so much for sharing at Merry Monday! Thanks for the visit and the comment, Lindsay. I hope you enjoy the pigs in a blanket. My family loves them. OHHHHH, puff pastry Parmesan pigs! Yum! Yep, we always have pigs, and that plate is the first one emptied. Can't wait to try your version! Hi Jenna. These are very tasty pigs! I hope you love them as much as I do. My husband and I LOVE pigs in a blanket! We had them at our wedding! I have never thought to add cheese though! I might have to try that next time! Thanks for linking up with us at Blogger's Spotlight and please come back next week! Hi, Carrie. Thanks for your comment. You should try the cheese on your pigs in a blanket. So yummy!